ESCHER, short for Electric Series Compliant Humanoid for Emergency Response, makes its way down the track during day two of the DARPA Robotics Challenge (DRC) in Pomona, Calif. Both the US and Japan are seeking help from private industry to advance high-tech innovation on robotics. The U.S. Defense Department announced in late 2014 an initiative to reinvigorate American military technology innovation known as the “Third Offset Strategy,” and after a year of classified investigation and secret deliberation some early components of this strategy are being revealed. Initial reviews of the approach have highlighted the futuristic (almost sci-fi) vision for next-generation U.S. weapons programs – robots, swarming drones, “Iron Man” suits and the like – but equally noteworthy are new aspects of the concept for how these systems might be developed and deployed more efficiently. Key changes include proactively tapping non-defense high-tech companies for targeted contributions and deepening collaboration with trusted allies like Japan to help catalyze breakthrough applications, but these new concepts face many hurdles. Tucked inside the 2017 U.S. defense budget request (announced in February) is about $15 billion to place relatively small research bets on over-the-horizon technologies that can help the United States military maintain a leading edge over any competitor over the long term. Close allies like Japan have an interest in seeing this effort succeed. Priority investments range from energy production and storage to so-called lethal endgame technologies, including lasers or directed energy weapons, but a particularly intriguing focus is the broad arena of robotics, autonomous systems, and artificial intelligence. Of course, the Pentagon has been experimenting with many of these autonomous technologies for several years, but the level of outreach recently to U.S. tech hubs in Silicon Valley (where Google and others are developing self-driving cars, among other gadgets) and with potential Japanese contributors has risen considerably. The effort to work with new partners, however, is challenged by concern on the part of many firms about becoming associated too closely with military programs and adversely affecting their reputations with average consumers. This “reputation risk” dynamic was clearly evident at a robotics challenge event organized by the U.S. Defense Advanced Research Projects Agency (DARPA) from 2012 to 2015, but the sponsors and participants were at times able to transcend such inhibitions, which could open doors for collaboration in the future. At the start, the U.S. Defense Department sought to facilitate cooperation with new partners in Japan, negotiating its first ever terms of reference agreements with the Japan Ministry of Economy, Trade, and Industry and the Ministry of Education, Culture, Sports, Science, & Technology. The key was to focus on robotics applications for humanitarian assistance and disaster recovery and to limit cooperative projects to dual-use technology. The University of Tokyo, however, prohibited some of Japan’s top roboticists from participating in the Challenge due to its rules against defense-related research. Eventually two assistant professors gave up their positions at the Japanese University to participate, creating a new company called Schaft Inc. that went on to win the semifinal round. The ironic twist occurred partway through the competition when Google bought out Schaft (and some other competition participants) and ran into its own reputation dilemma, since Google had long vowed not to pursue military contracts. Shortly thereafter, Google pulled Schaft from the competition, demonstrating that private sector sensitivity about military entanglements is not a phenomenon unique to Japan. Several other non-defense companies stayed in the competition, however, and U.S. Secretary of Defense Ash Carter has tried to boost this kind of public-private collaboration in ways that strengthen U.S. and allied security interests without compromising important academic or free enterprise principles. One way is to enlist contributions from civilian individuals (with company support) via a new National Guard unit called the Cyber Operations Group to help conduct threat assessments for U.S. defense networks. In addition, Carter started the Defense Digital Service (modeled on a White House version) to bring in talented computer programmers from the private sector to work on special short-term projects. The Pentagon also invested in an experimental Defense Innovation Unit based in Silicon Valley to scout out new technologies and develop relationships with technology companies in the area. Complementing all of this is a new Defense Innovation Advisory Board for the Defense Secretary chaired by none other than Eric Schmidt, the executive chairman of Google’s parent company, which suggests that there is more than one way to solicit private sector input in the defense arena. Another interesting outgrowth from the DARPA Robotics Challenge is the follow-on hire of its American program manager by Toyota Research Institute to lead its new research and development enterprise funded largely by the Japanese automaker (and with an office in Silicon Valley). The Institute’s purpose is to help bridge the gap between fundamental research and product development, and it benefits from membership on its advisory board by former U.S. Ambassador to Japan John Roos and former U.S. Navy Secretary Richard Danzig. One should not assume that simple geographic proximity or Board presence will help the allies accomplish their bilateral cooperation objectives given the private interests at stake, but such cross-fertilization can yield mutual benefits if policymakers cultivate an appreciation for collective interest while respecting the companies’ confidentiality needs. After all, a sustained allied edge in the defense arena has shown over time to support stability and economic growth that benefit all involved. In terms of outreach to the private and academic sectors, the Japanese government is moving in a similar direction of the U.S. Defense Department, albeit at a slower pace due to deeper political sensitivities in the country. Still, the government’s fifth Science and Technology Basic Plan, released in December 2015, highlighted a wider connection between the nation’s technical prowess and national security than ever before, paving the way for stronger cooperation on defense-related research and development among universities and private companies. The Defense Ministry, for example, is collaborating on projects with Tokyo Denki University on controlling unmanned aerial vehicles, with Panasonic on technology for wireless undersea transmission of electric power, and the Kanagawa Institute of Technology on strengthening ultrafine carbon fibers. Meanwhile, the United States and Japan have a long-standing bilateral mechanism called the Systems and Technology Forum to facilitate collaboration on defense-related technologies and system interoperability, although its record of achievement is modest due to past trade tensions and bureaucratic inertia. The United States and Japan included in their 2015 Guidelines for Defense Cooperation an emphasis on defense equipment and technology as a “bilateral enterprise,” and each country is making efforts to strengthen ties with the private sector is this area as well, but the way forward on both counts is unclear. Despite all of the connections between the allies’ robotics and defense communities, as well as the spirit of shared national interests, it is inherently difficult to use a government-led process as a way to engineer bilateral technical breakthroughs. In addition, enthusiasm by non-defense companies for military associations will likely remain muted. Sustained leadership and flexibility on these issues in Washington and Tokyo, however, can produce positive results over time. The DARPA Robotics Challenge was one creative initiative that sparked new relationships and pushed the state of the art forward, but other efforts can be made. There is room for new and broader concepts of bilateral robotics and autonomous systems collaboration in a dual-use context, and the United States and Japan can be leaders in this field. 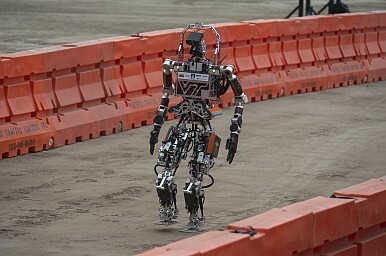 Disaster relief robotics in particular is a promising area for expanded cooperation and competition, which could include a disaster robot Olympics held every four years, as proposed by Tohoku University’s Satoshi Tadokoro, or adding robotics to some of the science diplomacy programs carried out by Japan and the United States with many countries in Southeast Asia. The goal would be to increase the number of producers and consumers of robotics technology among trusted partners around the world, which should benefit these countries and grow a market featuring a strong U.S. and Japanese competitive position. Promoting cross-border investment and high-tech engineering collaboration is another productive avenue, such as that performed by the firm Linkers, which connects small- to mid-size Japanese engineering firms with system integrators in Japan and the United States. The digital revolution is still in its early stages, and its future will be brighter with a long-term U.S.-Japan partnership. James L. Schoff is a Sr. Associate in the Asia Program at the Carnegie Endowment for International Peace and a former Sr. Advisor for East Asia Policy at the U.S. Department of Defense.